Place mirror on wall and make sure it is level. Mark hole locations onto wall, set mirror aside. NOTE: Hole locations may very slightly. Replace mirror in the same position to ensure proper hole alignment. Drill pilot holes using a 3/32 inch drill bit -OR- if using wall anchors (recommended for drywall installation) drill pilot holes using a 3/16 inch drill bit. Push wall anchors into pilot holes until flush with the wall, gently tap with hammer if needed. Remove plastic cover from mirror. Hold mirror on wall and make sure all hole are aligned Rotate mirror to align holes if needed. Place finish washer over hole so the lager side is against the mirror. Insert screw through washer and into hole / wall anchor. Gently hand tighten screw. DO NOT OVER TIGHTEN. Repeat this step for all screws. Use wall anchors for additional stability and safety. NOTE: Hand tighten screws only; do not use an automatic screwdriver. Cracks or distortions in the mirror may occur if the screws are over tightened. Slightly loosen screws of the mirror becomes distorted around the holes. Peel and apply tape squares to the back of the mirror - around the perimeter approximately 1 inch from the edge. Leave front cover masking on to prevent fingerprints. Peel off mounting tape tabs to expose adhesive. Place mirror on wall or door and press firmly around the perimeter to secure. Carefully remove protective cover from front of mirror. Check mirror for any sharp corners or edges prior to installation or use. The mirrors must be secured to a wall or door. Gently clean mirror with a soft cloth, water and a mild soap if needed. Do not use abrasive towels or cleaners that may scratch the surface. Why use mirrors? The answer is really much more complex than "meets the eye." Using mirrors with infant and toddlers in a daycare setting is a developmental tool used to teach self recognition. Young children can also develop pre-reading skills from the use of mirrors by learning pronunciation, vocabulary, and the skill of identification. So, before purchasing daycare mirrors learn the reasons for using the mirrors, activities to do with infant-toddlers with the mirrors to foster learning and ultimately selecting the best ones for safety. 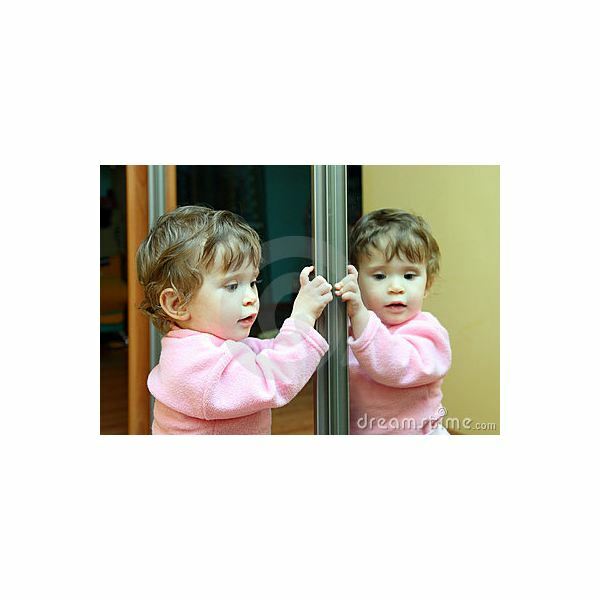 Much research in using mirrors with infants and toddlers to promote self-awareness, ego and reading skills comes from the theory of the Mirror Stage, attributed to the works of psychiatrist, Jacques Lacan. The Mirror Stage, said to be from the ages of six to eighteen months old, is when a child begins to recognize "self" as the image he or she sees in the mirror. When using mirrors with infant and toddlers, be sure the mirrors are placed at their level for height. Children should also receive supervised, interactive play with the mirrors. Promote Self Identification- Tape a picture of the child onto the mirror. Say the infant's name aloud and point to the reflection in the mirror and to the picture of the child. Imitate- Make a face in the mirror with the infant or toddler and attribute a word to the face, for example, angry, sad, happy, or afraid and so on. This teaches children how to imitate and early identification of feelings. Next, make silly faces and sounds in the mirror and have the child repeat. For older toddlers, include the written word on an index card for children to associate the written word, with the spoken word and the expression in the mirror. Older students can learn to pronounce letter sounds in this way. For example, teach the child that short "o" makes the "o" sound as you drop your jaw and have him or her repeat. Build Vocabulary- Name the body parts as you guide the child to touch his or her eyes, nose, mouth, forehead, ears, and neck and ask, "Where are your eyes?" Be sure to pronounce each word clearly and allow the child to repeat. Practice Motor Skills- Have the infants or toddlers try to "catch" bubbles as you slowly blow the bubbles against the mirror. This is a great way for infants to learn to follow with their eyes and is a great opportunity to increase hand-eye coordination. Have older toddlers practice getting dressed in the mirror. At first, this should be a simple task, such as putting on a jacket or socks. Praise every attempt the children make. Using mirrors as an instrument for teaching is certain to be a lot of fun for young children, while promoting their self-awareness and ultimately self-esteem. There are many developmental activities to do with infants and toddlers in a daycare setting using mirrors, including imitating, self-awareness, vocabulary building and even motor skills. Enjoy the interactive play, but always use unbreakable mirrors for the safety of the children.